As a sustainable material manufactured in the UK and responsibly sourced, Versital were delighted when its’ bar tops were included in the new design Centre ‘Cornflake’, designed by Ecoism. 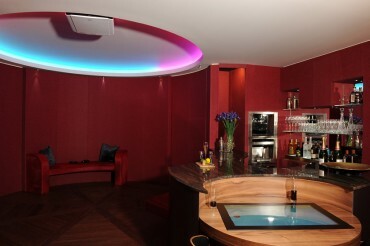 Versital manufacture a range of surfaces for commercial installations, including bar tops and bar panels. Please call us direct on 01204 380780 for more information and a personalised bar top quotation. The Cornflake project has been designed to resemble a luxury apartment and allows prospective clients to road test the latest home automation technology. The exclusive showroom – open By Invitation only – will be used for entertaining and also for CPD training for architects, designers and developers, providing the company with a luxurious showroom in the heart of the Capital. The team combined cutting edge technology and sustainable materials to show case 21st century living. 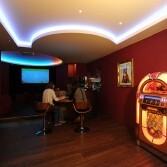 Part of the design included a state of the art games room with bespoke bar area. 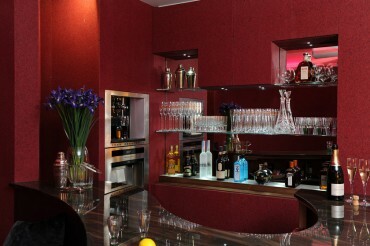 This fabulous bar top design, made in one piece to template, was manufactured from Versital in the marble finish ‘Wenge’. Being a sustainable product manufactured in the UK makes Versital the ideal choice for modern designs, especially when the carbon footprint and being environmentally friendly is becoming increasingly important. Versital is manufactured exclusively in the UK, bringing down its’ Carbon footprint enormously. It is also manufactured from completely sustainable sources, making it suitable for eco-friendly projects. Ecoism have a fantastic reputation, having been featured in grand designs. To find out how Versital bar tops and other sustainable materials can be used in your projects like Ecoism, please call us direct on 01204 380780, or read more at the bar tops page.